Saints and Spinners: What Shall We Do With the Boo-Hoo Baby? Yesterday, I went through some skills assessment interviews with the library system where I sometimes tell stories. My last skills assessment was two years ago, and while my assessment scores were okay, they didn't reflect how good I really could be. Besides, two years ago, I didn't play guitar. I brought in my guitar for the storytelling component of the skills assessment. Even when I went through the reference interview and reader's advisory parts of the assessment, I was glad that my guitar was nearby. Although I don't play my guitar slung low over my hips (the practice may look cool but it's an ergonomic disaster), I've got more confidence now that I've got Diamond Lil in my life. 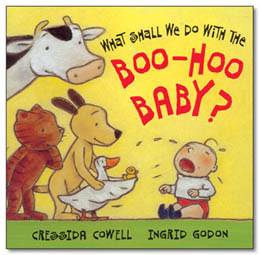 For the children's storytime part of the assessment, I read What Shall We Do With the Boo-Hoo Baby? by Cressida Cowell, illustrated by Ingrid Godon. April 7 update: I just received a letter regarding my skills assessments. The person who wrote the letter informed me that my new scores were lower than the original set of scores. I still get to keep my original set of scores. I plan to call to find out exactly what the system wanted that I didn't provide. The interviewers had given me positive feedback. It's a hard pill to swallow to think that they may have just been polite. What did they want? Whatever it was, it definitely wasn't a singing, guitar-playing storyteller. As Jed Bartlett in The West Wing would say, "What's next?" Oh, this is too fun! Thanks for sharing this one. HipWriterMama: You're welcome! Thanks for appreciating it. I *love* What Shall We Do With the Boo Hoo Baby. It's one of my standard baby shower gifts. The song sounds so much fun. I can't play guitar, but the other children's librarian I work with does and I'm going to send this to him to take a look at. Bummer on the assessment, though. Being assessed is always yucky, and the idea of getting "scored" on storytelling is even yuckier. How is a score helpful for something like storytelling? Positive feedback, constructive criticism, things that might help one do what one does better -- but a score? I don't know how I'd handle that. Not well, probably. I really wish I could hear you play and sing this song. I think you are on an entirely different coast than I, though. Bit of a drive. Adrienne: Thank you. I was wondering if anyone would see the addendum in the backlog, but I wrote it anyway, just in case. The rating just confirms what I suspected for a long time: that I'm not really "meant" to return to my traditional library job. I know I'm a good storyteller (not a great storyteller, but a good one, and that is good enough for me). I know patrons appreciate me. I just don't get it. If I were the only one who got a lousy rating (the equivalent of a "B" average), that would be one thing. However, other good librarians have gotten similar ratings. Hey, if you're ever in Seattle, I'd be glad to play "Boo Hoo Baby" for you... plus all 10 verses of "This Old Man." Try to stop me! Thanks for stopping by, Adrienne. Your note gave me a lift on a day that was mostly good but had a smattering of disappointment in it. How disappointing that they did such an assessment. You ought to be appreciated more! What's wrong with them anyway? I love your songs! This gives me just another good reason to get myself to Seattle one of these days.